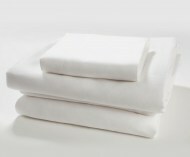 Conventional sheets use chemicals like bleach to achieve the pure white colour - however, these chemicals have been shown to be harmful. Thus, in line with GOTS certifications, our organic white bed sheets are lightened using hydrogen peroxide, no bleach. So go ahead and enjoy the soothing colour and peace of mind of organic white bed sheets.